Data sharing is inevitable in the current Digital ecosystem. Individuals and Entities end up sharing the Data, knowingly or otherwise, related to Identity, Transaction, personal preferences etc.. This is aptly called ‘Digital trail or exhaust’ and needs to be carefully controlled. If the privacy is not preserved, Data sharing in Digital economy poses significant risks to Individuals and Organization. However, there are clear benefits of sharing the Data in the form of better insights resulting in superior services and value to the Data provider. Very good example of this service is the Traffic congestion shown on Google maps. Data required to determine traffic congestion is provided by commuters through the Telecom operators. Social media companies such as Google, Facebook, Twitter are well-known examples of value added services provided at zero cost to Customers. They are also effectively monetizing the Data collected through these services. Data needs to be considered more as Raw material for the value added services offered. Availability of Raw data is a must have for the current economy. Several forms of Data monetization models have emerged where ‘Trusted third party’ ends up owning incredible amount of Data. Individuals and Organization providing the Data are unfortunately not well informed about the mechanisms nor risks associated with this[i]. The concept of Privacy preserving data sharing may seem like a Death blow to these Businesses. Digital Identity is a case in point. This is changing very rapidly from both perspective. On one side, Governments across the Globe are realizing the need to regulate this process by providing basic protection to Individuals in the form data privacy laws or creating infrastructure for Data governance and authenticity (e.g. GPDR in EU)[ii]. It is also becoming clear that the ‘Trusted Third Parties’ cannot be trusted completely, Sony play station network, Target Database clearly highlight the risk[iii]. The challenges arising out of Data breach or single point of failure can have devastating impact on the Digital economy. On the other side, recent developments in Privacy proving Anonymization techniques, Big Data, Decentralized Databases, Distributed ledgers & Decentralized Apps (Dapps) may provide the crucial Trade off. The article is an attempt to join the dots and propose a solution. What is Data Privacy ? : privacy is the privilege to have some control over how the personal information is collected and used. Information privacy is the capacity of an individual or group to stop information about themselves from becoming known to people other than those they give the information to. One serious user privacy issue is the identification of personal information during transmission over the Internet. Payment processing Industry has been on the forefront of this. Adoption of EMV, PCI DSS standards and Tokenization are prominent examples. 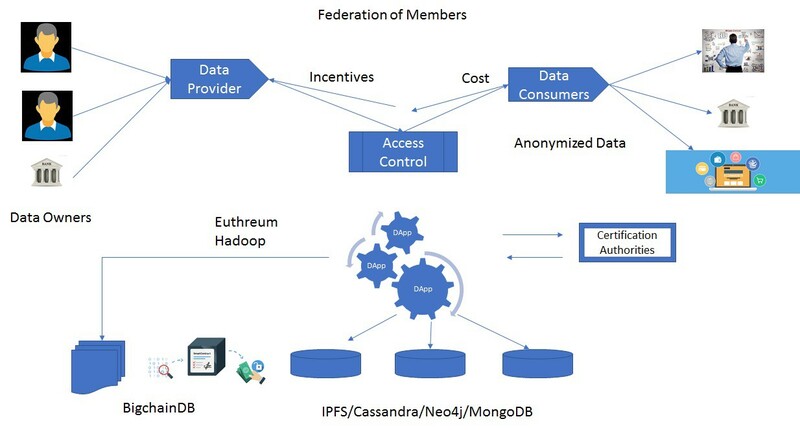 The proposed Data Infrastructure can also create mechanism which allows Individuals to share Digital content selectively and securely with other participants with complete control. Privacy preserving decentralized infrastructure can provide avenues to monetize the Data by Value Added services such as Data Analytics computation platform. Section below provides Logical & Conceptual Technical view of the proposed solution. It is assumed that there will be a Federated model (No need for Trusted Third party) of Participants who join based certain agreed Protocol. Initially, a Lead Agency would need to create the charter for the Participants. Data Providers and Consumers will need to be ‘Permissioned’ to join the Consortium. The role of Lead Agency can be performed by Regulators / Government agencies to kick start the process and ensure that the charter created for the consortium is both fair and complies with Regulations or Law of the land. These organization are providing critical solution for Identity verification, Fraud detection, P2P payments. While these platforms are definite improvement over current solutions, there is need for further improvements. Platforms such as KYC Chain[xi] have attempted to provide some of those improvements by creating a potential decentralized platform. Decentralized Data Market place for Identity can be long term solution providing wide coverage. Such common Identity Data can help address key issues faced by Govt, Regulators, Banks, Law enforcement agencies without compromising on Data Privacy issues. Availability of Quality Health Care Data can make wonders to society. Data such as Genome data can provide insights which can benefit Individuals, Research organization and Pharma companies. This applies not just to Genome or Individual DNA but other health related information. It can help prevent and provide critical medical help. Privacy preservation and security is equally critical element of this solution. Any breach or misuse of Medical information can disastrous. Availability of this data along with powerful Analytical and Machine learning algorithms can make this platform extremely useful to Individuals, Health care industry, Insurance companies & Government. To realize benefits of Big Data, Machine learning and AI assumes availability of Quality Data covering large population. Decentralized Privacy preserving Data market place can address several issues in sharing data without compromising the Privacy. Development in various Technologies related Anonymization, Distributed Ledgers & Distributed Databases provides promise to deliver this.